Give your child a head-start on learning. It’s easy when you choose All Day Daycare & Learning Center, a full-service daycare center serving families in Virginia Beach, VA, and nearby communities. For more than 10 years, we’ve provided high-quality, professional child care services. To that end, our staff consists of attentive teachers, each of whom treats students as unique individuals. We work individually with each child to build positive relationships that facilitate a comprehensive learning environment. Your child’s learning is organized in a daily schedule so that he or she can have a comfortable routine. However, our hours are negotiable. Turn to our daycare and kindergarten prep to enhance your child’s life with nurturing care and attention from our loving teachers. We welcome the opportunity to earn your trust and deliver the best service in the industry. Just let us know which of these schedules works best for you and your child. Our goal is to make learning fun and convenient for our kids, as well as provide parents with complete peace of mind around the clock. As a full-service daycare center, we pride ourselves on offering comprehensive child care services in an enriching environment. When you leave your little ones with us, you can rest easy knowing you’ve made a great decision. Our staff brings more than three decades of experience to our center, and we are CPR-certified to improve safety and emergency preparedness. With healthy meals, affordable enrollment, and fun field trips, we truly offer everything families want in a daycare center. 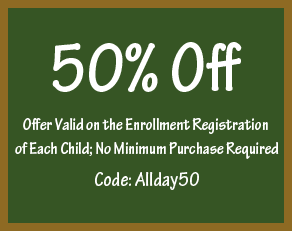 Enroll your child in an all-day daycare and learning center in Virginia Beach, VA that will be sure to involve him or her in the learning process, both mentally and physically. Our dynamic curriculum includes both indoor and outdoor learning activities for a well-rounded education. Picture the look of excitement on your child’s face when he or she is given the opportunity to visit the local zoo, botanical gardens, The Virginia Aquarium or Cloud9 Bounce Park on one of the many field trips with All Day Daycare & Learning Center. Other outings include visits to the local central library, city and community parks, and walks throughout the community. Located in Virginia Beach, Virginia, All Day Daycare & Learning Center is a full-service daycare center and has been providing high-quality, professional child care services for more than ten years. As a commercial child care centers, we provide attentive teachers who treat each student as a unique individual. Our friendly staff cares for every child and works to build positive relationships with them. Contact our full-service daycare today to learn more about our programs and curriculum. We proudly serve families in Virginia Beach, Virginia, and nearby areas.